Recently, I’ve been publishing guest posts in an effort to expand the range of topics covered by Valuist. Inviting qualified authors to lend their expertise also helps me attain the goal of this blog: to help readers find the greatest values everywhere. And given that I have no deep understanding of whole life insurance, today’s article written by Scott W. Johnson is a valuable contribution. I’ve also never been busier, which hopefully, somewhat explains my sad lack of personal contributions in the last five months. We recently put an offer down on a house, despite the costs and headaches I mentioned in my article: The True Cost of Buying a Home. Also, my wife could go into labor at any time and the “nesting” thing you hear about, is real . The topic of life insurance, has certainly never been my strong suit- In fact I’ve avoided the subject for the most part. When I briefly looked whole life insurance a few years ago, I was unnerved by the complex fee structures and payout terms. I couldn’t see the value in it. It seemed to me that whole life insurance is intended for those who can’t manage their investments. However, with our first kid on the way, it’s time to take another look. 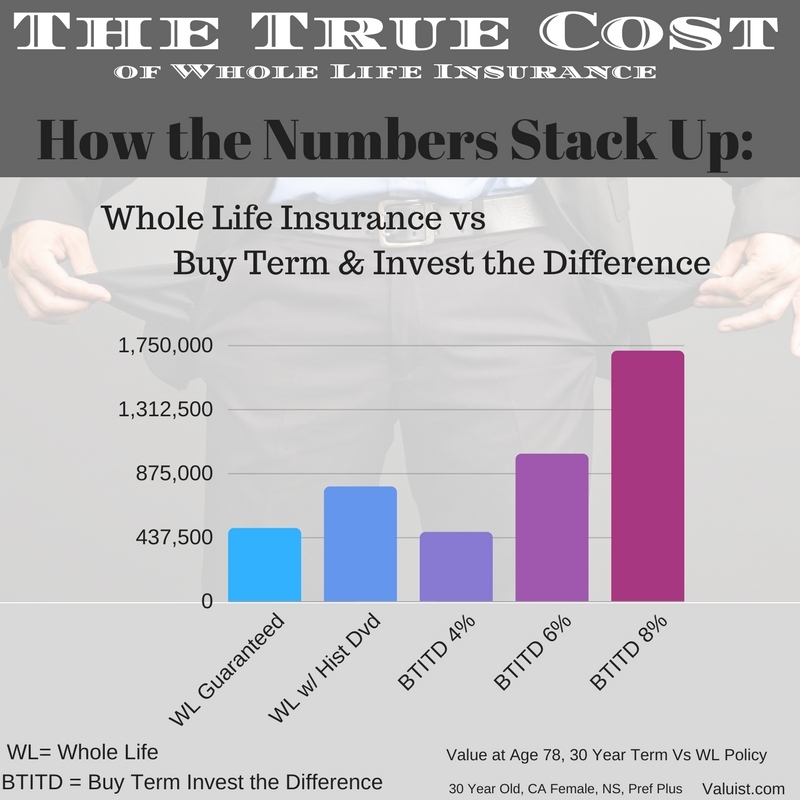 Fortunately, Scott W. Johnson, owner at WholeVsTermLifeInsurance.com knows this topic intimately and has offered to illuminate me and the Valuist readers as to the true cost of whole life insurance. This should serve as a great starting place for further comparison. The following is Scott’s article. In the last twenty years, due to a variety of factors the cost of term life insurance has gone down, way down. In fact a simple level term life insurance policy can cost you far less per month than to insure your cell phone. Term life can now be purchased in buckets of time spanning 10 to 30 years, enough time to solve almost any adult’s true needs. However, the costs for whole life insurance still remain relatively expensive, especially when compared with its cousin term life. Whole life insurance is a policy that is intended to last your entire life, both the death benefit and the premiums. Although there are versions of these policies that allow you to pay the policy off in a shorter period of time, these are so expensive as to make them not a real choice for most. For typical whole policies the yearly premiums are level, meaning they are the same each and every year. Because the chances of you dying young are so low, these policies build up what is known as a Cash Value account. These cash accounts have the potential to accumulate dividends. If this sounds oddly similar to an investment, it’s probably because an insurance agent told you this. Term life insurance, is insurance for only a limited period of time (the term). At the end of the term, the death benefit and the premiums generally end. Term life insurance is truly temporary insurance. The general benefit of term life insurance is that it can free money up for you to invest in other accounts such as Roth IRAs, 401Ks, HSAs, and 529 accounts. This is often referred to as Buy Term and Invest the Difference or BTITD. For our example we will choose a 30 year old woman that wants to start a family of her own. She has just completed a backpacking trip and has started her first real job in corporate America. She makes $50,000 per year and probably needs about $500,000 per year in life insurance. Her husband also works and needs a term policy of his own (that is another story). She starts shopping online and luckily, finds an insurance agent who advised her to buy a 30 year term life insurance policy rather than the whole life insurance plan recommended by her home/auto insurance agent. Since she is healthy, young, doesn’t smoke, and doesn’t scuba dive, a 30 year term policy is highly affordable for her. The yearly cost, each and every year is only $320. The cost for a competing participating whole life insurance policy with the exact same death benefit ($500K) is about $3,530 per year. But after paying her yearly 25% in income taxes, and all of the other expenses that a 30 year old has, it’s hard to see how she can even afford this. But for arguments sake, let us just assume she can and that she is not one of the majority of Americans that buy whole life insurance policies and cancel them long before they die. Does it make more sense for her to spend $3,530 on a whole life insurance policy or $320 on a term policy and invest the remaining $3,210 per year in her Roth IRA? Her Roth IRA is invested in the market and the Whole Life Insurance policy receives yearly policy dividends on the cash value of the account. As with most whole life insurance policies the vast majority of premiums used in the first couple of years go towards marketing and sales expenses. Hence there is very little ‘cash value’ to accumulate dividends in the account until about year 10. Nonetheless we assume that her whole life policy receives a yearly dividend check which she uses to increase the size of the whole life policy by a small amount each year. About age 78, which according to the CDC is the current approximate life expectancy, her total Net Death Benefit is about $784K. In other words her heirs will receive $784,000 in life insurance benefits, which will more than likely be income tax free. Not too bad for a lifetime of savings on an income of $50,000 per year. However when you compare this number with what she could have had from putting money into her Roth IRA when choosing instead to buy a level term 30 year policy, it disappoints. At age 78 or so, she would have about $1,008,000 with only a 6% rate of return. With an 8% return she would have about $1,712,000. Remember since this is in a Roth IRA it is tax free in most situations. Admittedly at age 78 she won’t have life insurance – but with that much in savings does she need to? A closer look at these numbers shows some other salient details. It only makes financial sense to go with the whole life insurance policy in this scenario if she is unable to make a return on her Roth of about 4.1%. Also the rate she is getting on her whole life policy dividend – is not guaranteed (we used a historical number), the only thing guaranteed is the $500,000 in original death benefit. That assumed dividend payment will fluctuate and in this long term low interest rate period – it is getting harder and harder for participating whole life carriers to meet past history. Of course, the same could be said for her investments in her Roth IRA – they too will fluctuate and are not guaranteed. One of the major detractors of these complex forms of life insurance are the, “what if” scenarios. What if you she loses her job? What if she gets terribly ill and needs the money at a younger age? The list is endless. According to the Wall Street Journal about 45% of Americans that buy whole life insurance policies, cancel them in the first ten years. Chances are that this is because locking up so much money every year is extremely hard to do. If, in any one year the client needs to skip an investment with her Roth IRA – its not that big of a deal. However, if she misses a whole life insurance payment – it will throw the entire policy out of whack. Insurance carriers are certainly aware of this issue and have created methods that allow clients to pull money out via policy loans or to receive the dividends as cash payments. But none of these solutions are ideal and they all will hammer the ultimate net death benefit. Whole life insurance is a pretty useful tool for a select few Americans – but it comes at a gigantic cost for most. Assuming our client is one of those few that is able to pay the yearly premium every year for her entire life, it is likely to cost her about $224,000 in comparison to simply buying a Roth IRA earning 6% and will significantly decrease her overall flexibility. Do you think there is value in whole life insurance? What about term life? Let us know in the comments!